Orafol's Orabond 1397PP double-sided clear PET tape is engineered with excellent holding power and extreme resistance to UV light, solvents and plasticizer. This tape features high peel and shear strength and 160 degrees C / 320 degrees F long term temperature resistance. Useful in creating a wide range of indoor and out-door signage including POP displays, banners APET, fluted PP board, Falcon foam, Lexan, hi-impact Styrene, etc. 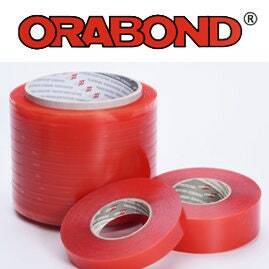 Use Orabond 1397PP when you need a high stress resistant tape that will hold and last. PVC extrusions, furniture trims, splicing for high temperature operations, splicing of difficult materials, production of sails for sailboards.